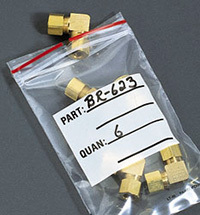 The size and thickness of the contents usually determine the gauge poly bag you need. But you should also consider the weight, bulk and puncturability of the contents. Each of these factors adds to the stress a bag will undergo. Weight and bulk become even more significant stress factors if the poly bag and contents will hang on a rack. Puncturability is important to keep in mind even though many of the objects you are shipping may not be considered very sharp or pointed. Wood screws, for instance, require a 4 mil gauge rather than a 2 mil gauge because movement in transit and frequent handling tend to increase the wear and tear the wood screws place on the bag and increase their chances of puncturing the bag. 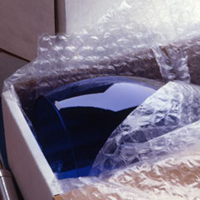 Using bubblewrap and wadding cushioning or "dunnage" to fill the voids in a box can eliminate the three major causes of damage in shipping. Cushioning can absorb the shock when a carton is dropped, can prevent the damage caused by compression when cartons are stacked and can prevent damage caused by vibration as well as shift and drift. If you ship a product frequently and you are not sure how much dunnage or cushioning you need, try sample shipments to yourself. Prevent shipping damage and reduce costly damage claims effectively and economically by wrapping items and filling empty spaces in boxes with cushioning from TigerPak. We carry easy-to-handle perforated bubble rolls, laborsaving bubble bags, pre-cut wadding for superior absorbency, and many other types of cushioning. Call and we'll find you cushioning that's best for what you ship. 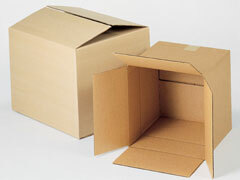 Box size will depend on the size of the item and the amount of cushioning it requires. As a rule, choose a box as close as possible to the size of the item and use cushioning to fill the voids. You may ship a non-breakable 6" x 6" x 4" item in a 6" x 6" x 4" stock box. The precise fit prevents compression from stacking. However, a fragile item requires a box that allows sufficient room for cushioning. In addition to stock sizes of traditional cartons, boxes, mailers and mailing tubes we carry a wide range of top-of-the-line carton accessories. Tigerpak can customize any type of carton. When ordering our boxes, remember the sizes specified are the inside measurements. They are given in the order of length, width and depth. Looking into the box opening, length is the longer dimension, width is the shorter. Depth is measured perpendicular to the length and width. Measure end-loading boxes in the same way. Depth is still measured perpendicular to the length and width of the carton opening. With non-reinforced gummed tape, 3" is the recommended width. Use an "H" closure. top and bottom. Three pieces of tape form the "H": one down the middle and one on each end. With 3" reinforced gummed tape and with 2" and 3" pressure-sensitive tape, no "H" formation is needed. Use one strip across the top opening and one across the bottom opening. Always extend the strip of tape at least 2" down each side. Seal cartons, mailers and envelopes with our high-quality gummed and pressure-sensitive tapes available in several widths and colors, along with top-of-the-line tape dispensers. TigerPak also carries strapping tape, tools and accessories, for unitizing and reinforcing. 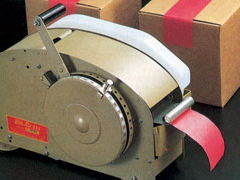 Avoid 90% of tape machine problems with the following maintenance procedure. Check and refill water reservoir at the start of each shift. Carefully follow the manual instructions for disassembly. Flush the tank, thoroughly wash the brushes and clean all parts once a week. Oil the machine according to your manual, coating the blades to prevent asphalt or tape resin build-up. Do not oil an electric dispenser motor. To keep your gummed tape dispenser and surplus rolls of tape in top condition when they are not being used, we recommend storing them at a moderate temperature and humidity. Avoid putting them close to radiators, open windows or other sources of moisture. 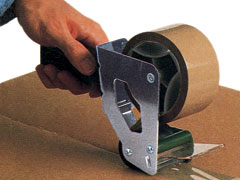 Store tape in the original container and tuck in the carton flaps each time you remove a roll of tape. Always use the oldest tape first. 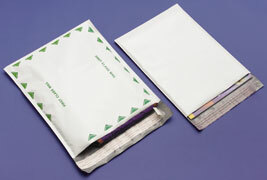 Bags are the economical way to ship any self-supporting or crush-resistant item that can't be damaged by compression, such as a book or clothing, A padded or bubble bag can be used to ship an item that comes in its own hard-walled container, such as a hand-held calculator or flash attachment. Bags are labor-saving, quick to seal and do not take much space to inventory. But whether you use a bag or a box, it's important to wrap the item in sufficient cushioning if it is fragile. Tigerpak offers competitively-priced shipping bags from the best manufacturers for every shipping need: bubble, padded, non-padded, and water-resistant. We carry courier envelopes like those used by major overnight carriers with tamper-evident closures to safeguard documents.